Being buried alive is a scenario most of us thankfully only experience in nightmares. But for off-piste skiing fans, lured by the thrill of carving their own tracks through fresh powder snow, it’s an ever-present risk. More than 150 people – mostly skiers, snowboarders and snowmobilers – are killed in avalanches every year, according to National Geographic statistics. This month alone, there have been deaths in Switzerland, Italy, Canada and North America. Drone manufacturers claim UAVs (unmanned aerial vehicles) could slash the toll by finding victims faster, and allowing ski patrollers to clear snow on high-risk slopes using explosives – without endangering themselves. Some mountain rescue services claim drones reduce their search times by up to 50%, because a drone can scan a large avalanche site more quickly than a person on foot. And when it comes to avalanches, time is of the essence. More than 90% of people buried by avalanches survive if dug out within 15 minutes. But after 45 minutes, the odds of survival drop to about 20%. Suffocation is the main cause of death. “Once you’re trapped, you can’t move, even if you’re only under 10cm (4in) of snow, and carbon dioxide quickly builds up around your mouth,” says avalanche expert Henry Schniewind. For someone in this situation, the best hope of rescue is currently an avalanche transceiver. Worn under your jacket, these hand-sized radio devices emit a low-power pulsed signal when activated. They can also be switched to receive mode, allowing those skiing with avalanche victims to pinpoint the area where the signal is strongest, then use probes and shovels to dig them out. 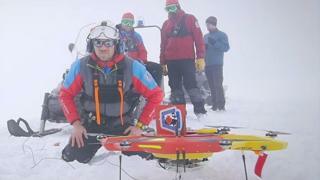 The Czech Mountain Rescue Service (MRS) uses Robodrone Kingfisher drones fitted with cameras and its own avalanche transceiver detection system to locate buried skiers. “We use drones fitted with a special system that works on the 457kHz frequency to detect avalanche transceivers,” says MRS drone operator Marek Frys. But finding someone’s exact location on difficult terrain often takes too long. New triple-antenna transceivers can help boost the signal, but what do you do about people who aren’t wearing any kind of transceiver? “We are working on thermal and multispectral systems that can see gases such as methane and carbon dioxide and could also detect people buried in mud slides, or under rubble,” explains Jean-Yves Barman, chief executive of software developer SCS Smart City Swiss. But finding people is one thing, digging them out is another. And no drones can yet do the digging. This is where dogs, fellow skiers and rescue teams are needed. “The goal is to find them and dig them out as fast as you can,” Mr Schniewind says. Some skiwear is now fitted with so-called Recco reflectors that bounce back a directional signal to mountain rescue teams equipped with a Recco detector. Mr Georges believes drones could also become indispensible for mountain guides heading off the beaten track. “Having seen how small and quick to activate drones can be, I would not be surprised if all guides are soon carrying one,” he says. Many off-piste skiers also wear backpacks that incorporate avalanche airbags, designed to inflate when the wearer pulls a cord, and keep them on the surface of the snow. The latest innovations in this field include German airbag manufacturer ABS’s wireless partner activation system, that triggers all the bags in a group when one cord is pulled. ABS chief executive Dr Stefan Mohr says the technology can “remotely trigger partner airbags thanks to integrated wireless group activation, actively preventing the burial of more than one person”. And avalanche specialist Pieps has introduced an airbag that automatically deflates three minutes after being triggered so “the pressure on the buried person is reduced and a big air pocket is created”. But the essence of avalanche survival remains freeing those trapped as quickly as possible, Mr Schniewind says. Setting off controlled avalanches to prevent deadly slides happening in the first place is one of the main responsibilities of patrol teams working in ski resorts. “Limiting avalanche danger is a big part of our work,” says Pascal Sevoz, director of piste services in the French resort of Meribel-Mottaret. It can be dangerous work. Just last month, two ski patrollers were killed in the French resort of Morillon when an explosive detonated before they could move away. So if drones could do this work, more lives might be saved. Mountain Drones, a Colorado-based start-up, has developed a prototype drone capable of carrying the charges used to trigger controlled avalanches, allowing humans to keep a safe distance away from the explosions. But the firm has hit a regulatory brick wall owing to the US government’s ban on drones carrying explosives. “Our technology is ready to go, but we’ve had to put development on hold because the federal government will not allow civilian operators to fly weaponised drones over US soil,” explains co-founder Brent Holbrook.